Maqbara means “cemetery” in Arabic. 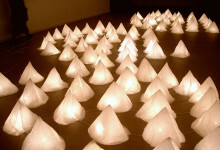 The installation bearing this name is comprised of a group of ninety-nine cones made of shroud fabric inside of which are placed light bulbs that diffuse a lightly yellow light. 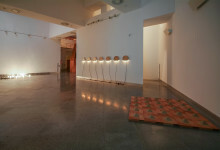 The ninety-nine cones are arranged in three groups of thirty-three cones, each group drawing the form of a tree leaf on the ground that recalls the myrtle left on tombs in Morocco.